This article first appeared in the Gloucester Citizen on Friday 11 September 1891. Mr. W. St. Leger contributes Part II of his article on "A Canal Tour"
The Stroudwater Canal takes us through pretty country, with hills ahead of us, and the ascent of the valley is soon perceptible in the number of locks which pass before reaching Walbridge, by Stroud, where the Stroudwater Canal ends, and the Thames and Severn begins. Here the most striking part the expedition begins. This is the ascent of the Golden Valley to the summit tunnel at Sapperton. The ascent is so steep that in the eight miles or so there are no less than 27 locks be worked. The scenery is lovely. The busy little river Stroudwater [sic Frome] runs alongside the towing-path, working the numerous mills of Brimscombe and Chalford, whose stone-built houses are perched up the face of the steep chalk cliff one above the other with most unfamiliar effect. As we go higher up the valley the hills close in upon us, but still mount amid scenery of ever varying charm. As far as Chalford there is just now a moderate amount of traffic, the narrow monkey-boats being generally drawn by a pair of donkeys, who, as a rule, are sleek and well-looking little animals, and pay no sort of attention to the vengeful urgings of their drivers. The drivers, in turn, seem to regard a truculent harangue every few minutes as part of the art and mystery of donkey driving, and so with mutual content they do their day's duty. Up beyond traffic is very sparse. The solitude is charming, and is scarcely broken by the contrast of the Great Western line, which runs near, sometimes coming quite close. The line is on steep incline, and we see a train urged on from behind by an auxiliary engine, while its proper steed puffs strenuously in front. As we approach the summit the locks come thicker and faster. There is a quaint little deserted wharf at Daneway Basin, and here we pause to realise that the arduous climb is nearly over. One more lock through the little bridge, and we tie up the boat and cross over to the little inn by the water side. Here we buy matches and couple of candles to light us through the two miles of darkness, and having learnt from the itinerant lock-keeper, who has accompanied our progress from Puck Mill, that he is expecting two "boats" through that afternoon, but that they "won't hurt we," even if we should meet in the tunnel, we get on board again, and address ourselves to this desperate adventure. There is little Sapperton upon the hill, with the grey church spire and the scattered houses. A turn in the Canal, and lo, close in front of us is the tunnel mouth, terribly black in the green hill and golden sunshine. The hill through which the tunnel is pierced is the "divide." When we are through, the runnels and rills will be making their way into the Thames, directly or indirectly. On this side they are running towards the Severn Sea. One last regretful glance at the bright scene, and we prepare to begin what is really the homeward journey. Sapperton tunnel is fairly lofty and of good width, but it is not wide enough to scull through. We sit round therefore on the thwarts, facing the bow, and paddle with shortened sculls, having first lit a candle and fixed it up in the bow, with hat in front of it to keep off the draught; and then, with ever hollower echoes from wall and water, we begin to penetrate the darkness. The candle light gleams strangely on the brickwork and more strangely on the rough rock through which the way is at times hewn. Conversation flags after a bit. How long have we been in? A quarter of an hour. Three quarters and more before we shall see the blessed sun again. Behind us the opening shows the most beautiful translucent green, where the sun is shining on trees and grassy bank. In front there is Stygian darkness, save for the bobbing of the candle light as the boat sways to an energetic stroke. Presently the sound of falling water fills the air. Louder and louder as we approach it, solemn and pervading, giving rise to dire imaginings, as that the boat will be filled by the torrent as we pass, and sink beneath us; and though we believe that the water is only about 3 feet 6 inches deep, who knows what desperate developments of reptilia or lurking monsters of the mire may not have gorged themselves with darkness till their lightest bite would make the victim blind? The torrent proves to be nothing but the water from a little spring, running in a perfectly orderly manner down a pipe, and by a reaction of feeling we find ourselves quite at home in the long vault. But suddenly there comes faintly echoing, with hollow roar, the unmistakable sound of an approaching barge. The small faint point of light far, far ahead, which had begun to become visible, is hidden; and ever and anon comes the curious, ponderous echo of the heavy barge pole. Can we get past? That is the question. If not, we shall have back out for a good mile and start again, with great loss of time and labour, when the barge has emerged. Presently we can make out the form of the approaching monster, which in the gloom looks large enough to block the whole tunnel. When within easy speaking distance we hail the bargeman, "Can we get past you?" "You be all right," says the invisible wielder of the pole. "I'll hold my boat against the side, time you get by." And so he does, and we gingerly go past with the aid of the boat-hook, with a good foot to spare. A second barge is following about 50 yards behind, but there are now no disquieting doubts. This "boat" is also held against the wall, and then we see clearly ahead the unobstructed light at the home end of the tunnel. After more than two miles of this travelling we greet the bright sunlight with joyful song, and ascend the steep bank and make pilgrimage to the Tunnel House, a highly picturesque inn at the Coates end. There is a great change in the character of the country. Wide pastures, and little stone walls, grey granges here and there, and generally Anglo-Saxon feeling about. We piously visit the head spring of be Thames, which is quite dry, a fact which leads us to fear that there may be very short water in the upper reaches of the stream when we strike it at Lechlade. Cirencester, and Cricklade, and Kempsford, and a goodly number of locks mark the canal on its downward road to the Thames Valley; and on a bright evening we sight the beautiful poplars at Inglesham, give up the canal pass to the widow woman who lives at the round house by Inglesham lock, and are once more on the waters of the Thames. At Lechlade we see the crested grebe which Mr. Spiers, of "The Crown," shot during the hard weather, and learn from him the story of how he was stuck in the tunnel while trying to get a house-boat through. Farewell peaceful little Lechlade and its pleasant inn and graceful spire, and away through regions which seem to be unchanged since the Heptarchy. The Upper Thames is itself a region of infinite romance and delight, but time fails to speak of this lovely region now. We come down with very high water to the more familiar scenes, and in the cool of a beautiful evening leave the boat at Abingdon, and come back richer by many days in the open air, and a store of most delightful memories. 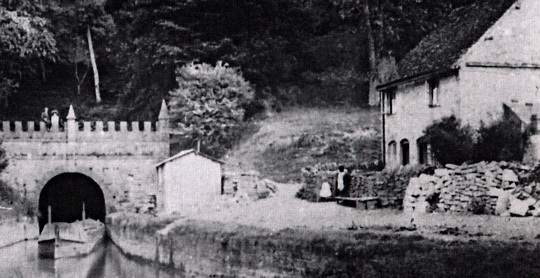 The photograph, which did not appear with the original article, has been reproduced courtesy of the Edwin Cuss Photographic Collection and has appeared in the series of books entitled 'The Stroudwater and Thames & Severn Canals from Old Photographs'.